You are here: Home / Nature News / Nature News / Pollinators in trouble! As a teaching orchard we have a special fondness for pollinators. The population declines encountered by Honey Bees and bat species are frightening. These small creatures are responsible for a huge proportion of global pollination. Bats also play key roles in seed dispersal and pest control. Read on for the latest news on their struggles. The primary cause of decline in bats is White Nose Syndrome. Healthy forests need healthy bats. 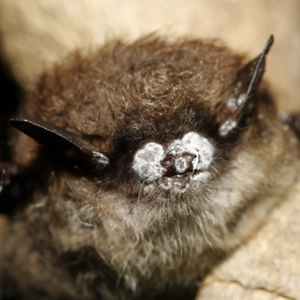 Sadly millions of bats in the Northeast have already been killed by White Nose Syndrome. The fungus is moving southward and westward towards Wisconsin and Minnesota. Today there is some good news. In some of the caves struck by the syndrome there are small populations of survivors. You can help bats through Citizen Science efforts and by providing shelter in the form of bat houses. This fall the USDA Forest Service produced a short video about the difficulties faced by bats in North America and the work to save bats. Those following the search for a cause of Colony Collapse Disorder and a solution to the problem which causes a 30% die-off of bees annually will enjoy this video. University of Minnesota’s bee researcher Marla Spivak presented a TED talk on some of the factors that contribute to the problems that Honey Bees are facing. She also presents some simple things we can do to help bees, which are as easy as planting native flowers. For more on our bees watch her fascinating presentation here. https://carpenternaturecenter.org/wp-content/uploads/2016/10/Little_Brown_Bat_with_White_Nose_Syndrome-2.jpg 300 300 Carpenter Nature Center https://carpenternaturecenter.org/wp-content/uploads/2016/08/carpenter-nature-center-logo.png Carpenter Nature Center2016-10-09 18:34:352016-10-09 18:34:35Pollinators in trouble! Is buckthorn killing frogs? Where are the monarchs?